Sandra Corbitt-Sears has been self-employed as a writer, editor and webmaster for over 17 years. She has held positions as a university career counselor, employee assistance program counselor and department administrator. Corbitt-Sears earned a Bachelor of Arts degree in psychology from the University of Nebraska at Lincoln and a Master of Science degree in counseling and guidance from the University of Nebraska at Omaha. Stevia rebaudiana is a perennial shrub that is native to Paraguay and Brazil. Because stevia contains intensely sweet compounds, it has long been used as a sugar substitute in Japan, China and South America. Despite its long history in other countries, the path to stevia’s acceptance in the U.S. has been bumpy. Proponents insist that stevia is both safe and beneficial, and some research studies support their claims. Others, including the FDA, caution that there is no clear evidence that stevia offers any health benefits. 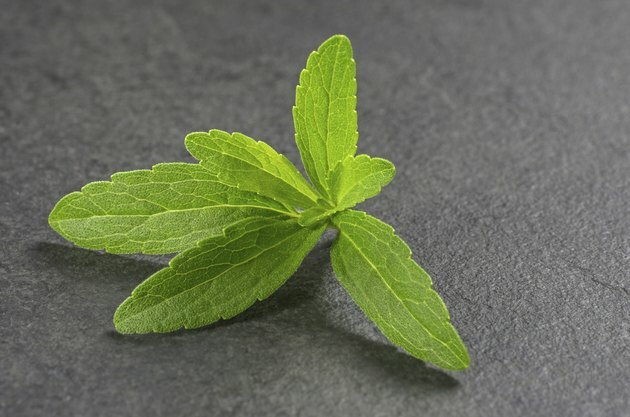 Scientists have isolated eight steviol glycosides, the components responsible for stevia’s sweet taste. The most potent of the eight is stevioside, which has a long-lasting flavor as much as 300 times sweeter than sugar. At high concentrations, stevioside produces a bitter aftertaste. When used at normal concentrations, most people find the taste pleasant, and some have compared it to the flavor of licorice. The FDA banned stevia in 1991, citing an absence of adequate information about its safety as a food additive and concerns about possible toxicity. After Congress passed the Dietary Supplement Health and Safety Act of 1994, the FDA changed its stance on stevia, allowing it to be sold as a dietary supplement while continuing to ban it as a sweetener. In 2008, the FDA approved Rebaudioside A, or Reb-A, a highly purified component of stevia, as a sugar substitute. Reb-A is sold under various trademarks, including Truvia, PureVia, and SweetLeaf. Steviol glycosides are completely metabolized in the body. Because stevia’s components do not accumulate, they provide the body with no calories, making stevia useful as part of a weight loss plan. Reb-A, the FDA-approved form of stevia, won’t break down when subjected to heat, so it can be used in a variety of recipes as a substitute for sugar, thus lowering the overall intake of calories. In addition to glycosides, whole stevia leaves contain calcium, potassium, iron, phosphorus, magnesium and zinc. According to the FDA, there is no evidence that stevia produces health benefits. However, results of early research studies suggest that finding evidence of stevia’s health benefits is just a matter of time. In two Chinese studies, high doses of stevioside reduced blood pressure in test subjects. However, no subjects in the control group of either study experienced a reduction in blood pressure, which raised concern that the methodology may have been flawed. In a 2002 Japanese study, four steviol glycosides inhibited the growth of skin tumors in mice. A study published in 2006 explored stevia’s potential to reduce inflammation, and research conducted in Korea in 2012 revealed that stevia possesses antioxidant properties. While stevia shows promise in treating a variety of conditions, further research is needed before it can be recommended as a therapeutic agent. Stevia has been used extensively in Japan since the early 1970s, and commercial stevia-based sweeteners have been available since 1977. Since that time, no ill effects have been attributed to stevia, and the World Health Organization declared stevia safe for human consumption in 2006. The studies that demonstrated stevia’s potential to lower blood pressure created concern that it might cause dangerous drops in blood pressure levels for certain individuals, including those already on medication to lower blood pressure. However, the blood pressure studies used extremely high doses of stevioside, far beyond the amount that any individual would ingest as a sweetener. Although caution is advised for pregnant or nursing women, children and those with cardiovascular disease or diabetes, the occasional use of stevia is generally considered safe. Texas A&amp;amp;M AgriLife Extension: Sugar Substitutes – Weight Loss, Diabetes, Safety, Nutrition? How Much Stevia Can You Have a Day? What Are the Dangers of Splenda, Sucralose and Aspartame?